November 14th, 2014 was celebrated as Children’s Day all across India. On the very same day the MBA department of BMS College of Engineering had organized an International Conference on the topic - “Sustainable business models in emerging global economy”. The conference was spread across 2 days- November 13th and November 14th. Plenary sessions were organized wherein companies from diverse backgrounds came and shared about their business models, and how they have been sustaining and growing in constantly changing conditions of the global economy. McDonald’s, CloudNine, LnT, Inspiration Unlimited were some of the key companies which were part of the plenary sessions. They shared about the importance of values and visions for growing companies in emerging global economy and some of the key areas where they exhibited their expertise. On the second day of the conference LnT, CloudNine and Inspiration Unlimited were the companies scheduled to discuss their business models with the audience that consisted of MBA students, teachers, entrepreneurs and professionals from different companies. Initially, Mr. Siddarth, Chief People’s Officer from CloudNine shared how the 7 year old company in the health sector had been successful in delivering 23,000 babies without losing a single mother till date. He also spoke about the kind of training that is provided to the nursing staff and about the various kinds of facilities the CloudNine hospitals offer to make the birth of a baby a memorable experience for the entire family. Then, it was the turn of the most senior company on stage to share their achievements over the past 7 decades. Mr. Hande and Mr. Ravi shared about how LnT Company had worked with the public and private sectors to build the infrastructure of the nation. In fact, the ex-finance minister P Chidambaram had called LnT as a national sector company for the same reason during the Diamond Jubilee Celebrations of LnT. LnT has constructed airports, seaports, roads, bridges, manufacturing industries, new machines and a lot more, not just in India but across the world. They even shared about how the engineers at LnT handled the financial crisis due to the business slump during 2008-09, which has become a case study for many people involved in manufacturing businesses across the world. The last company to take the stage was the youngest company in the plenary session. It was just a 2 year young company which had celebrated its 2nd anniversary just a day before the conference on November 13th. Mr. Mohan BN, the Lead Speaker of Inspiration Unlimited, shared about the business model that this young company had been successful in executing over the past two years to sustain in this challenging business scenario. He explained about how this young team was working on training solutions helping students from schools and colleges and corporate professionals on various aspects. The initial struggles and strategies of how the company ventured into the fields like web-solutions, digital media marketing, events and media were also shared. Importance of team work and investment of intellectual capital was stressed more than financial investments. 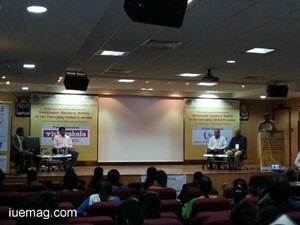 The social projects of IU such as IUnewspaperbag, IU Literacy, adad.in and the works of Trusts like 36meals.com, IU Care Foundation, were also discussed as a part of business model presentation because IU believes that contribution to the society is an intricate part of the business model of the company. Q&A was a part of the conference agenda as well and the audience was quite interested in participating in the whole session. The whole staff of MBA department of BMSCE made sure the event went on to become a grand success achieving its objectives. The HOD of MBA department, Ms. Satyanandini and the other staff consisting of Ms. Lakshmi Hegde, Ms. Shobha and other lecturers along with the student volunteers made sure that the company personnel and the audience had a great experience being a part of this conference.